By beginning with a cocktail hour, you will give your guests a chance to gather at the reception facility, deposit their gifts, and meet and mingle with other guests. It will also provide time for lost guests to find their way to the reception. Meanwhile backstage, this time can be used by the photographer to take portraits of the wedding party. 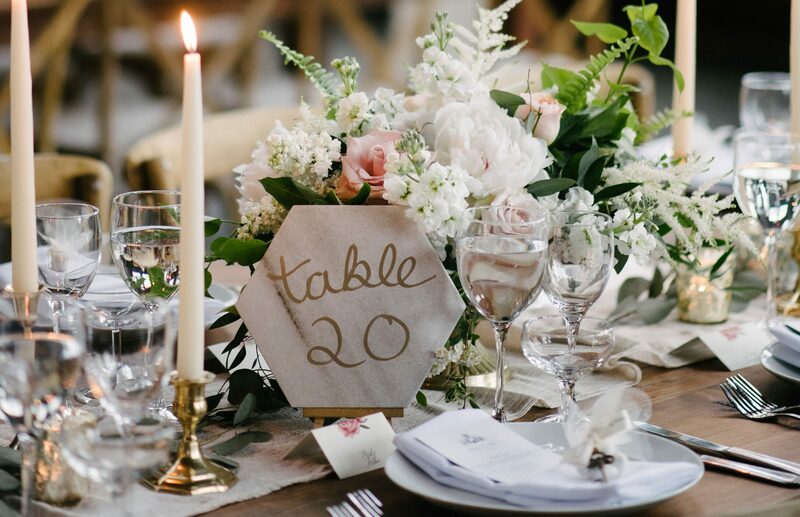 If desired, the bridal couple can arrange to eat at this time, ensuring that they will indeed get to eat, thus freeing up their time to mix and mingle with guests later on during the lunch/dinner portion of the reception. The cocktail hour usually takes place at the reception hall. The bridal couple can open up the reception hall with a receiving line and invite everyone inside. This will ensure that the bridal couple will have the opportunity to greet each guest at least once during the festivities. The reception line traditionally includes the bridal couple, the couples’ parents, the best man, the maid-of-honor, and any special guests. groomsmen and bridesmaids, then the flower girls and ring bearer, the parents, and the bridal couple. The First Dance, Father and Daughter Dance, etc. can occur before dinner immediately upon the Bride & Groom’s introduction to the reception area. This will allow the dancing to begin much earlier in the reception thereby eliminating a lull in activities that so often happens. Once the bride and groom have danced, and then the parents and attendants, then the guests will feel comfortable dancing while others may be eating or in a buffet line. This will allow many of the guests who know how to ballroom or maybe Latin dance to do so on a non-congested dance floor. they may wish to say. During this time, the bride and groom (if they have already eaten) can mingle and make informal visits to each table, or even have table pictures taken by the photographer. If guests wish to make speeches, sing songs, tell jokes, do a skit, this would be the ideal time. If the bride and groom haven’t danced their first dance yet, they may now take the opportunity to open up the dance floor with their first dance. Then the father/daughter dance, then the mother/son dance. The attendants then join in the dancing and then the guests are invited to dance as well. The bride and groom cut the cake for dessert. Additional toasts may be made at this point. Amid sparklers, confetti, bubbles, birdseed, or rice. In structuring your reception timeline, make sure to consult with your photographer, your disc jockey or musicians, your reception facility representative and/or caterer, and your bridal consultant if you have one. Also make sure your master of ceremonies is familiar with the scheduling of events.